Raja Ram Mohan Roy was born in a small village in the district of Hoogly in West Bengal named Radha Nagar. He was born on 22nd May 1772. His father Ramakanto Roy, belonged to Vaishnavite faith and his Mother Tarini, belonged to Shakta. He was sent to Patna for higher studies and by the age of 15 years, he had already learnt different languages which included Bangla, Persian, Arabic and Sanskrit. Raja Ram Mohan Roy was known as the maker of modern India. He founded the Brahmo Samaj, which was one of the first Indian social and religious reform institute. He was known as the first great leader of the modern Indian society and also a great scholar. The title of Raja was given to him by the Mughal Emperor Akbar II. He published his first book named as ‘tuhfat ul mohiddin’ in 1803. In this book, he harshly criticized the practice of idol worship based on his thoughts that all religions had faith in one single God. He purchased a Zamindari in Kolkata in the year 1814 and settled permanently. 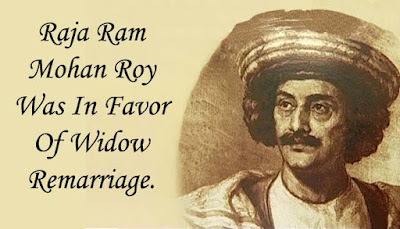 Raja Ram Mohan Roy was a social activist who educated the public on various political issues while condemning the dominating practices the Bengal Zamindars which had reduced the condition of the local peasants’ to misery. By using the Permanent Settlement Act of 1793, he fought for the rights of the peasants by demanding a fixed maximum amount of rent paid by the cultivators to the land owners on which the peasants used to farm. He also demanded the abolishment of the special privileges which the British East India Company enjoyed in trade and also the removal of the heavy tax duties which the Indian merchants had to pay to export their goods. It was a great step towards the betterment of the quality of life of the local merchants and handloom industries. He demanded that Indians should be allowed to be recruited in the superior services as he wanted the native residents of the territory to have a better say as to how the province was run. Apart from these issues, he also fought for of the separation of the Executive and Judiciary bodies of the administration, a jury system in the judiciary body and legal equality between Indians and Europeans. Brahmo Samaj was founded by Raja Ram Mohan Roy which played a very significant role in the abolishment of various social evils like the Sati Pratha. While working for the East India Company he studied Christianity and other religions extensively which made him come to the conclusion that some of the traditions of the Hindu religion were in serious need to be reformed. He was against the traditional ways and superstitions and hence raised his voice against the Sati Pratha, multiple marriages, the caste system and child marriage. His main motivation behind going against the Sati Pratha, which was a prominent practice at that time, was the death of his sister in law who had become Sati. Raja Ram Mohan Roy spent his life as a social reformer. He refused to accept the barriers which had been created by the caste system in the Indian Hindu society and stood forth as a light bearing man as a symbol of universalism and love. He spent his life by standing up against social evils by constantly agitating the public against inhuman customs of Sati Pratha. So, when Lord William Bentinck showed his desire to weed out this cruel action from the Indian society, he gave him his full support and rallied alongside him. It was his crucial input that Lord Bentinck used to finally come to the conclusion that the company's traditional policy of not to interfere in the Indian social traditions, to be put on hold. That's why he finally declared Sati Pratha illegal in all forms. When the traditional orthodox Hindus tried to protest by submitting a petition to the parliament which demanded a stay on the approval of Lord William Bentinck’s act, Raja Ram Mohan Roy organised another petition which included some of the enlightened Hindus demanding that Lord Bentink’s act against Sati Pratha be passed. He was always in the favour of women's rights. After the declaration of Sati Pratha being illegal, he went after polygamy and the degraded state of Hindu widows. He also demanded that women should also be given the right to inherit property. When in 1828 he founded the Brahmo Samaj, it was with the sole purpose to expose the irregularities of the Hindu religion in a way where he also opposed the growing influence of Christianity on the Hindu society. Religious reforms by Raja Ram Mohan Roy have had a significant impact on the Indian society. They have helped the country to get rid of several religious superstitions. He had very different views as far as religion was concerned. He constantly opposed idol worship and other meaningless rituals. He was of the view that all the Hindu religious books talk about one single God and he is the one who should be worshipped. According to Raja Ram Mohan Roy, truth lands with the way humans interpreted the words in the books. He opined that the philosophy of Vedanta was precisely based on reason. He was a strong objector of the Hindu religious practices but he did not confine his opinions solely to the Hindus. He also insisted that his rational approach also applied to Christianity as well. He could never digest the concept of blind faith even in the practices of Christians. This made the Christian missionaries oppose his theories which in turn made him defend the Hindu religion and its policies from the constant attacks of the Christians. He was of the opinion that all the religions preach and worship a common God. Raja Ram Mohan Roy's views on education were clear. He was an avid supporter of modern education and whole heartedly provided his cooperation when David Hare wanted to establish the famous Hindu College at Kolkata. He also maintained an English school in Kolkata from 1818 from his own pocket. By using his pamphlets and magazines, he helped in the evolution of a modern and graceful prose style for Bengali. He took a keen interest in the events around the world. He always supported democracy and nationalism and constantly opposed against injustice, oppression and tyranny. His fights against the social injustice and inequality cost him a great deal personally and made his life a lot more difficult than the average Indian. We all can imagine that standing up against religious traditions often results in clashes with the members of the family. Apart from these he also had constant bouts with the rich Zamindars and powerful missionaries who's pockets were about to get lighter in light of his activities.